Take great pride in doing the job right the first time by using a certified electrical contractor for your next project. Reviews from our customers are important in deciding who to hire. We strive to provide the best quality home, commercial and industrial certified electrical contractor, as well as the best customer service. Our professionals are highly experienced in bringing you the best experience possible when providing the electrical services you can depend on. Don’t Take Our Word for It… Read What Our Customers Have to Say! "Portman Electric was a one stop shop and was able to provide the materials, electrical labor, and plumbing labor (Generator is powered by natural gas, so a gas line needed to be run). They were knowledgeable during the quotation process, responsive, and most importantly, they did great work. My dad is retired commercial/industrial electrician 40+ years) and was very impressed with the quality of the work and their equipment. They were able to complete this complex project in one day which minimized the disruption. We are very happy to now have an electrical panel and service that meets code and a whole house standby generator for power outages that happen more frequently than you think. I highly recommend Portman Electric and would definitely use them again." "Very well! So pleased, we are having them do wiring and installation of ceiling fans." "It was a lot of work but Adam and Dennis were patient, hardworking, professional, and very pleasant. All debris was cleaned up. All work was explained. All testing was performed with customer." "They were very professional from the quote to the installation. The work site was clean and neat when they left." "Very easy folks to deal with. Called, made appointment, they came while I was at work then called me and billed the service call to my charge card. As always they were very cordial on the phone and came exactly as scheduled." "Showed up on time, did not take any breaks and were here all day, cleaned up and ran sweeper when they were done. Very polite, very professional & very courteous and respectful--would definitely recommend this company." "They were very helpful in what their recommendations were. They were not condescending. Diane and Donna from the office staff are wonderful." "I checked around on price and they were the lowest, then they threw in an extended warranty because I attended the Home and Garden Show and still took the Angie's List coupon. They arrived right on time, were very neat and professional. My house is 80 years old and the wiring is not the best. They spent a considerable amount of time on the fuse box, tightening wires that were installed poorly and even changing two fuses that they said were too small for the load - ALL AT NO ADDITIONAL CHARGE. We own two industrial buildings and in the future will call Portman for our electrical needs. They were great." "Portman was outstanding, very professional and cost was good. We checked other companies for generators and Portman's price was the best. They came out right when they said, laid tarp throughout work area to keep it clean, helped to identify electrical breakers to put on the panel and were thoroughly professional. I can't think of a single issue we had with them. Would absolutely use them again, in fact, they are installing my mother's generator later this month." "Outstanding Experience from initial contact through completed installation. Sales presentation was factual and based on our needs, not on their preferences. Allowed us time to consider quote and compare with other offers. Estimate was middle of the road, but based on reviews, and subsequent work, well worth the extra cost. Upon acceptance of contract, work was scheduled in a timely manner and staff arrived on time and ready to work. The proper leg work and local permits were filed ahead of time, (many contractors skip this part), preplans were made and all materials on site. Staff was professional, courteous, and willingly answered all my inquiries during the installation. A few unexpected issues were experienced during the installation and the owner himself came out to assist in the resolution and lend a hand in completing work on time due to these delays. I was gratified to see the owner pitch in so readily to help. He even "manned a shovel" to help with the back fill. The staff observed during the dig that my soil was especially rocky and suggested they place the gas line in a PVC sleeve to better protect it from damage. This was NOT in the estimate, NOT required by code, but plain old good practice and attention to detail. They also did this at NO ADDITIONAL CHARGE. On completion of the work, they thoroughly tested the system and explained to me all aspects of operation and maintenance I, as owner needed. In addition, they inspected my entire distribution system and made me aware of additional work needed to maximize safety and bring the system up to current code compliance. I cannot recommend this company highly enough. A MUST CONSIDER for electrical work especially head end distribution and generator installs." "Jeff, I just wanted to let you know how happy I am with the electrician you sent - Tim. He was definitely the right guy for this job on my RV. I guess it helped that he is also an RV enthusiast, be he wouldn't deviate from the plane even against all odds and 90 degree plus heat. I was ready to have him run a new line but he knew how improbable it was that the line itself was bad and knew there had to be a bad link somewhere. I told him I'd kiss him if he found it, but I only shook his hand instead. In addition to being very knowledgeable, he was a damn nice guy. Thanks again for Tim and thanks for sending him in such a timely manner. Your company shines above the rest of the crowd." "Portman Electric did a fantastic job at our home with all the electrical work required to install a hot tub. Their prompt service and good price was greatly appreciated. Not only did Tim our electrician complete the project that he quoted but he also solved a septic tank pump issue we were experiencing that saved us a lot of time and money. From my initial conversation with Jeff and his crew they were all very professional. I highly recommend Portman Electric to anyone looking for a reliable, competent and professional electrician." "As both the Maintenance & Engineering Manager over the past 30 years at a 60 year old manufacturing facility I've seen a lot of change as technology and product lines are replaced. With these projects you learn who is in business for the long term and who not only has their interest at heart but yours as well. Portman Electric has always gone above and beyond what was initially agreed to and has been one contractor I've come to rely on to complete all work in a safe, professional and cost effective manner." 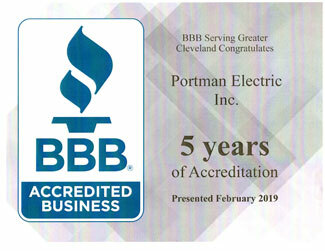 "Clark Rubber and Plastics has used Portman Electric for small projects over the years, so when we embarked on our large addition we turned to Portman Electric for our equipment electrical needs. Our manufacturing is very important to us, so price is only part of the equation. Quality and timing are also extremely important. In the end we were very pleased in our decision to go with Portman Electric." "After years of adding CNC machines at our manufacturing facility we began having problems with sufficient power to run the equipment. We called Portman Electric in to analyze the situation and really had a great experience. Jeff's level of professionalism and his crew's expertise quickly had our shop operating smoothly. We were so pleased that we call Portman in any time we get a major piece of machinery that needs installed." "Please relay to your entire group for me, my thanks for the hard work in getting our projects completed on time and within budget. The workmanship is always spot on! Portman Electric continues to deliver excellent workmanship, with a fast turn-a-round, and with a price that consistently beats the competition. On behalf of Pentair Chardon, Thanks again to the Portman Electric team for their collective great efforts."